Periwinkle (Vinca spp. ): growing, planting, caring. Scientific name : Vinca spp. Vinca is a genus of flowering plants in the family Apocynaceae native to Europe, northwest Africa and southwest Asia. It shares its common name with the related genus Catharanthus. Two of the species, Vinca major and Vinca minor, are extensively cultivated as a flowering evergreen ornamental plant. Because the plants are low and spread quickly, they are often used as groundcover. Many cultivars are available, with different plant, leaf, and flower - colors, sizes, and habits. Species of the genus are 20–70 cm (8–27.5 in) subshrubs or herbaceous, with opposite, lanceolate to ovate, 1–9 cm (0.5–3.5 in) long leaves and salverform - like those of Phlox - flowers. Vinca may be invasive in some regions, including parts of Australia, New Zealand, Canada, and the United States, especially coastal California. Periwinkles are ground covers, sub-shrubs and herbaceous perennials. Their leaves are persistent, shiny, opposite, lanceolate, elliptical or ovate, often variegated. The flowers have long petioles and five lobes. Plant your periwinkle in the sun or possibly in partial shade from February to April and from September to November. 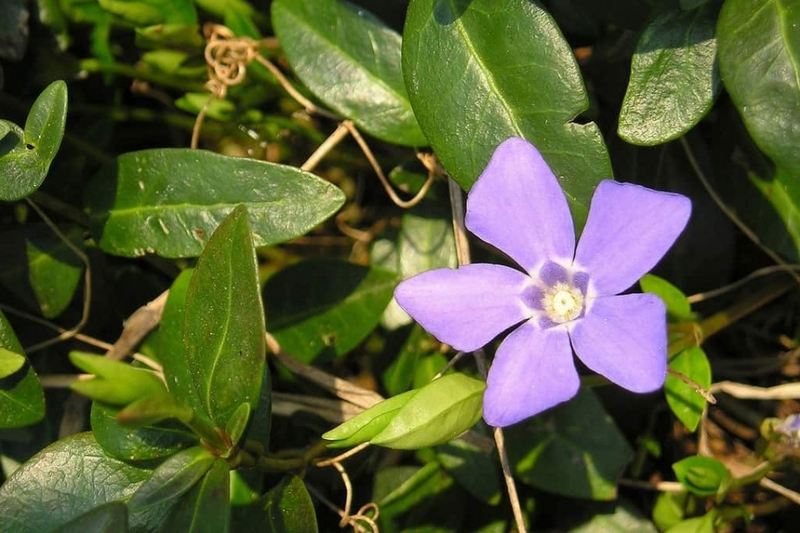 In the sun, the periwinkles need a cool soil to produce an abundant flowering. Remember: periwinkles are ground covers, so plan to keep some space around for their future expansion. Tamp the soil to avoid having air around the roots, then water thoroughly. During growth, water once or twice a week. In case of drought in summer, to prevent yellowing of foliage, water abundantly twice a week. In pots, water from April to October twice a week. In the case of periwinkles, after a few years it may be necessary to limit their development, otherwise you risk losing neighboring plants. Pull off the outer rods as needed. Generally, periwinkles are not very demanding in fertilizing, they are content with what is available. However if your soil is very poor and stony, a supply of organic matter-mulching in November can greatly help the first years. Very easy: between April and June, cut with a spade a part of the root ball, and replant it in a new location.